Dog Dementia, also know as Canine Cognitive Dysfunction or CCD, is primarily found in older dogs. It is characterized by the decline of cognitive functions resulting in behavioral changes in dogs. An abnormal amount of sleeping including during the day. Having uncharacteristic accidents in the house when they are trained. Staring at nothing and being overly sensitive to real or imagined sounds. Unable to relax, walking in circles, or pacing. Not recognizing family or friends any longer and showing aggression towards them. Not responding to their name or unable to do old tricks. While the exact cause of dog dementia has not been conclusively agreed on, experts believe that physical and chemical changes in the dog's body impact their brain function. Dogs with cognitive dysfunction have been found to have abnormal amounts of protein which has accumulated in their brain. These abnormal brain conditions can interfere with the circulation of blood to the brain as well as proper nerve transmission, which results in the behavioral changes. Conventional Treatment: Selegiline, also known as Anipryl, is the drug commonly prescribed for treating canine cognitive dysfunction. This drug has shown varying levels of effectiveness at reducing some of the symptoms of dog dementia and can cause some side effects including loss of appetite, excessive thirst, vomiting, anemia, and signs of confusion, disorientation and restlessness. Ginkgo: Widely considered an anti-aging herb, Ginkgo has proven to be effective in treating Alzheimer's disease in both dogs and people. Ginkgo boosts the long and short-term memory in dogs of all ages. Bacopa: This Ayurvedic herb has been used for centuries in India to enhance memory and concentration. Gotu Kola: An herb used in both Chinese and Ayurvedic medicine, that is particularly useful for memory problems and stress-related disorders. Do herbs really work for dogs? The answer is emphatically yes! Herbs have been shown to be highly effective in treating diseases in humans too, but dogs especially respond very well to them. If you consider a sick dog in the wild, it would naturally seek out and consume the herb or plant that would treat it's condition. It makes sense that dogs are so responsive to herbs, which is why herbs are becoming more widely used to treat dog diseases due to the fact that they are often more effective than pharmaceutical drugs and don't create the harmful side effects. Consuming liquid herbal tinctures is the most effective method for a dog (and humans) as they absorb immediately into the body. See below Testimonials from Dog Owners who have used the combination of herbs listed here. Research points to processed dog foods as a leading contributor to many diseases in dogs including Cancer, Pancreatitis and Dementia. Fresh, unprocessed food is the healthiest option you can feed your dog. While preparing food yourself is the most ideal, this may not be realistic for many. Other practical options might be to buy raw food from a company like Primal Dog Food or to begin to supplement their current diet with fresh or frozen raw food or fresh cooked meat. Dr. Pitcairn's Complete Guide to Natural Health for Dogs and Cats has lots of great simple-to-make meal options. You can view some of them here. Finally, walking your older dog is vitally important to their health. Even walking for just short intervals will help increase circulation and get blood flowing to the brain. Testimonials from Dog Owners of who have used the combination of herbs previously mentioned and available below. 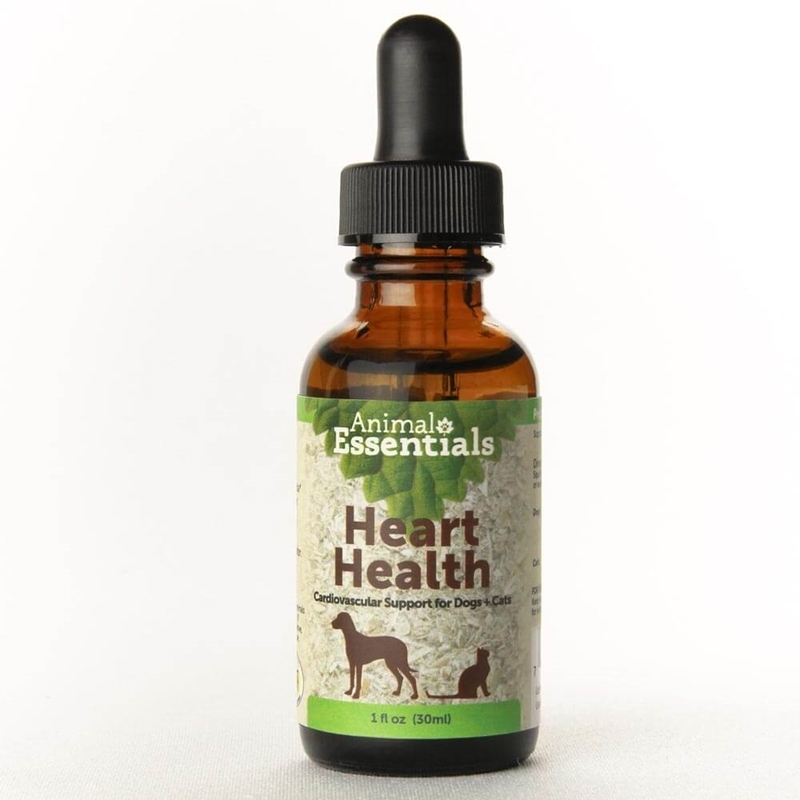 Animal Essentials Hearth Health 1 oz. Animal Essentials Hearth Health 4 oz.